Tanja is 20 years old and was born and raised in southern Denmark. She is an optimistic girl who is always smiling and is currently in her first year of studies in Marketing Management. Before starting at the IBA in Kolding, she took a year off of school to work in a local riding equipment store. There, she managed multiple social media accounts. Tanja has always had a great passion for horses and riding. She loves learning and experiencing new things and enjoys meeting new people and experiencing new cultures. After finishing her education in Marketing Management, she plans to continue her education at the IBA. Matěj is a 19-year-old who was born and raised in the Czech Republic. He is currently studying AP degree of Marketing Management at the IBA in Denmark. Before he started to study in Kolding, he had attended grammar school in Turnov where he developed an interest in mathematics and learning new languages. After finishing his education, he plans to launch his career in business. Matěj always has a positive attitude and believes that everything is much easier with a smile. Apart from his interest in new technologies and politics, Matěj loves basketball, reading fantasy books, meeting new people, and travelling. 23-year-old Kia was born in England and raised in Denmark. She is currently in her second semester of studying Marketing Management. Kia has former experience in the retailing business as a sales assistant in one of the biggest beauty-companies in Denmark, Matas A/S. Whenever Kia sees an opportunity to learn, she takes up the challenge. She has also been participating in a research project during her first semester of Marketing Management. In her spare time, she loves spending time with her beloved husband and 1-year-old son, cooking, baking, and reading financial newspapers. 23-year-old Rikke is an ambitious and challenge-seeking soul from Denmark. She’s studying Marketing Management at IBA and loves problem-solving, developing skills, and learning about new subjects. 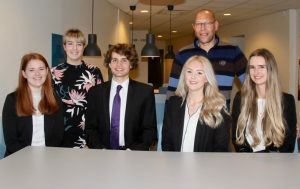 Rikke has a background in marketing from her high school days, where she studied at Shanghai Lixin University of Accounting and Finance in 2015. Rikke is an adventurous soul and spent her summer holidays in Hawaii improving her English skills at a language course with Education First in 2018. In her spare time, she goes to CEPOS Academy in Copenhagen, enjoys reading, surfing, traveling, watching space documentaries, and spending time with her friends and family. Didde is an alumnus of the International Business Academy. She finished her undergraduate degree in International Sales and Marketing Management in January. As a student, she has participated and won several business competitions around Europe and a bronze medal at the NIBS 2018 Competition in Guatemala. Her passion for travelling, interest in other cultures, and her adventurous soul has sent her around the globe for the past few years and she will go on another trip before pursuing a master’s degree. Albert is a lecturer in Finance, Accounting, Strategy, and Leadership at the IBA, specializing in International Finance. Before entering academia, he had a 23-year career in the United States Air Force achieving the rank of Lieutenant Colonel and owned a small consulting firm for 27 years, selling their client list in 2007. Albert enjoys music, movies, reading crime and action novels, basketball, and American football.